One of the most exciting parts of my job is seeing a client’s website come to life. It’s thrilling to me to take an empty canvas and turn it into a space that reflects my client, communicates what they do and helps to grow their business. 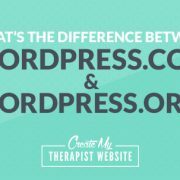 What was once a parked domain is suddenly a way for my client to be found and reach the people she feels called to serve. 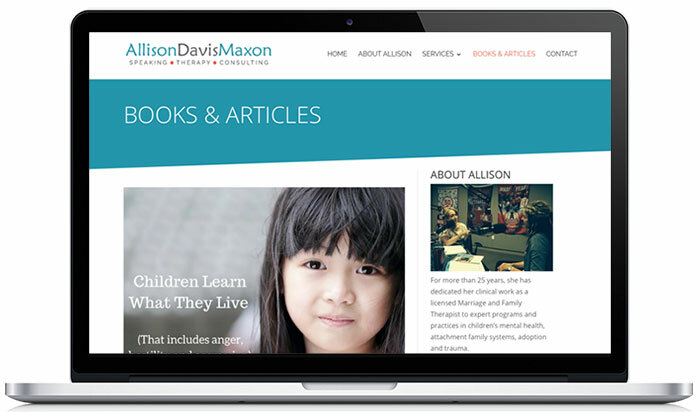 Today, we’re showcasing the internet’s newest addition, Allison Davis Maxon. Allison has dedicated her more than 25 years of clinical work as a licensed Marriage and Family Therapist to expert programs and practices in children’s mental health, attachment family systems, adoption and trauma. Not only is she a therapist, but she’s an educator, speaker and consultant dedicated to helping children, families and organizations connect, heal and thrive. When Allison and I first met, she didn’t have a website. An impressive feat, given the scope of work you’ll find in her resume and list of experience! As Allison’s vision for her business grew to reach more audiences through speaking, consulting and writing, she knew that a website was needed to showcase her past experience and build authority for the future. She was also in the process of writing a book and knew that a professional website would be key to a successful launch in the future. Allison’s vision for the future of her business relied on having a website now in order to get where she needs to be. 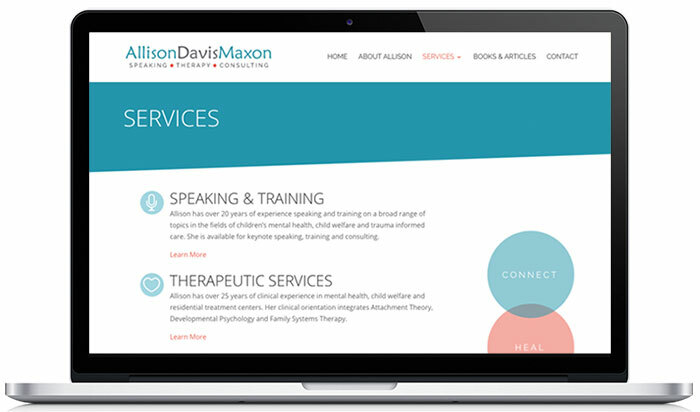 If she wanted to attract more speaking opportunities, get more clients and share her passion and expertise with the world, (Allison is an expert in the fields of child welfare, adoption and children’s mental health) she needed a website. 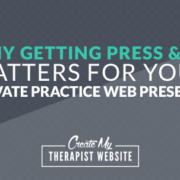 As with all of my clients, Allison and I started with a conversation about where she was at in her business, where she wanted to go and how a website could help her get there. Then, I gathered a whole bunch of information from Allison, via a questionnaire I send my new clients, that gives me an idea of their design style. How do you want visitors to feel when they come to your website? What type of fonts and colors are you drawn to? Allison had no problems telling me that she had looked at hundreds of websites to find inspiration and disliked just about all of them. “I honestly can’t stand the cookie-cutter looking sites that are out there,” she said. As the designer, I loved this type of honesty because it helps me know what my target is. 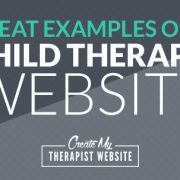 So my challenge was to take Allison’s impressive work and organize and showcase it with a website that was original, unique, easy to use and looked great on all devices. I got to work on her homepage and about page. These two pages would set the tone and design style for the rest of her website. To be honest, I was a bit nervous when it was time to get Allison’s first round of feedback on the work I’ve done. But it turned out she loved where I was taking her website and felt it truly captured her personality and preferences for her website. Now that Allison has a place her business can call home, she’s got a platform from which to market her vast experience and services. 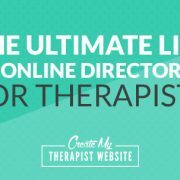 I use the Divi WordPress theme for my custom therapy websites, which gives my clients the power to easily make updates in the future. 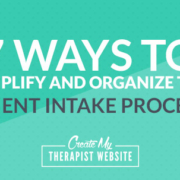 Allison has jumped right into content marketing and is now posting her own articles on her website and sharing those articles on her social media channels. And since she now has a website, any other place she contributes content can be linked back to her website. She’s got full control over how she drives traffic to attract new clients and opportunities. 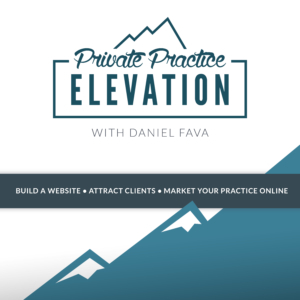 Does Your Website Match Your Vision for Your Private Practice? 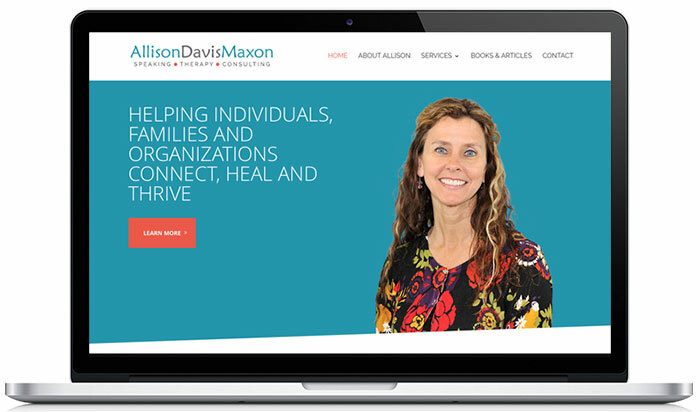 It was so much fun to see Allison’s website come to life and I’m honored to play a small part in getting her closer to her vision for her business. Your website is one of your most important marketing tools and I take pride in creating these tools for my clients. 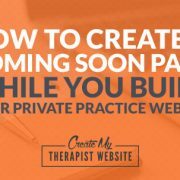 If you think your current website (or lack of website) is hurting the growth of your private practice, I’d love to talk. 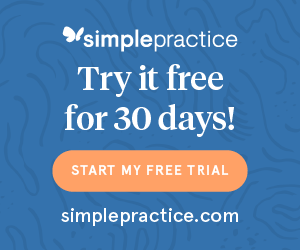 Click here to learn more about how we can work together and to schedule a free 30-minute consultation. Hi Daniel, thanks for sharing – that’s a great, clear website which conveys simple messages really well. Minor point for along the road at some point – I wonder if the picture on the main page could be made a bit less stark – perhaps just dial down the brightness a little? I love the picture of Allison on the ‘About’ page – it wordlessly conveys a natural warmth and kindness really strongly. Getting good images is hard – we use a pretty grainy one on our page which was an ad hoc informal shot we happened to have, because when we tried to do a “photo session”, the results didn’t come out relaxed at all.